"KABINETT stands for lightness, fun drinking, moderate alcohol, and goes well with food," Martin says. As for the 2013 Karthäuserhof Kabinett, he says, "[it] impressed everyone by its complexity, fineness, class, spiciness, lightness, drinking pleasure, food-versatility and moderate alcohol (around 8%)." Martin, who has a food and wine blog called berlinkitchen33, hosted a BerlinKabinettCup last year as well. He had, however, a different group of tasters—including the Berlin-based German sommelier Billy Wagner—come to his designer flat in an old building in Charlottenburg to taste the 2012 Kabinetts. For a blind tasting Chez Zwick, the wines are served in flights, and the jury has top-notch Zalto Universal glasses. (Though I can imagine a slightly smaller tulip-shaped glass might be better for these wines.) The winner of the BerlinKabinettCup 2013 was the 2012 Oberemmeler Hütte from Weingut von Hövel. In second place was the 2012 Scharzhofberger from Egon Müller. It was a great vintage for Kabinett in this corner of the Saar. Martin, however, is better known for his annual BerlinRieslingCups. It's another jury tasting, with the focus on the top dry German Rieslings, mostly Grosse Gewächse (GG) from VDP estates. Over the years, one of his favorite producers of high-end GGs, as well as other wines, is Klaus Peter Keller in Flörsheim-Dalsheim in Rheinhessen. Keller is considered one of the best winemakers of Riesling in Germany. Besides promoting German Riesling and other wines, I have heard that Martin is a talented cook as well. A couple of days ago, I first read about Martin's Kabinett tasting on Stuart Pigott's blog. (See a rather large portrait of Stuart, who is promoting his new film titled Wine Riot, which comes on the heels of his book called The Riesling Story: Best White Wine on Earth.) Stuart tweeted about his new German page called Weinhier. It's written by Frank Ebbinghaus, who attended BerlinKabinettCup 2014 and wrote an article about the tasting event, including those Kabinetts that he liked and didn't like so much. I even left my first ever reply on Stuart's blog. Although Stuart was busy with deadlines, he finally approved my comment, which was awaiting moderation for a while. Lars Carlberg: Thanks for your ranking, Martin. It should be noted, too, that in such tasting competitions, with winners and losers, the result might be different on another day or with a different group of tasters. In addition, a wine that scores low on a 100-point scale might be the better drinking wine down the road. There are also still Riesling Kabinett trocken and halbtrocken/feinherb wines, even though the VDP now defines Kabinett as being between 18 and 60 grams of sugar per liter. But there are a lot of delicious light Mosel wines that are under 18 grams, or have between 20 and 30 grams, but are not labeled Kabinett. I liked the 2013 Karthäuserhof Kabinett when I tasted it in the spring. Back then, I liked the Spätlese even more. I agree that Weiser-Künstler's 2013 Ellergrub Kabinett is tops, not to mention the Ellergrub Spätlese. Egon Müller's 2013 Scharzhofberger Kabinett Alte Reben is excellent, too. Martin Zwick: So true, Lars. I made this "BerlinKabinettCup" not because of another Cup, not because of ranking[s], not because of scores. The true star is the KABINETT. Here in Germany Kabinett was heavily overlooked in the last years, as most people drank trocken, trocken, trocken. My "BerlinKabinettCup" created awareness in Germany for Kabinett and now the people buy more Kabinett. That's [what it's] all about. Lars Carlberg: Martin, I feel one of the problems with Kabinett is that the VDP has focused on GG and only accepts the predicate Kabinett usually for the fruity-sweet style, while ignoring light, dryish, unchaptalized Rieslings from single vineyards. In other words, a member of the VDP isn't supposed to produce a Kabinett trocken/feinherb wine from a Grosse Lage. Yet these can be one-of-a-kind wines, too. So why do members have to declassify them into Guts- or Ortsweine if they come from old vines and great sites? There should be a way to highlight that the wines are light and unchaptalized. Germany isn't Burgundy. †Although some of the best producers, such as Joh. Jos. Prüm and Egon Müller, tend to have under 40 grams of sugar per liter for recent vintages of Kabinett, many of the other top producers have Kabinetts that might impress at a blind tasting, but are often a little too ripe and too sweet for Kabinett, especially when drinking more than a glass at home. I'm not referring to the top-rated wines at the two BerlinKabinettCups. 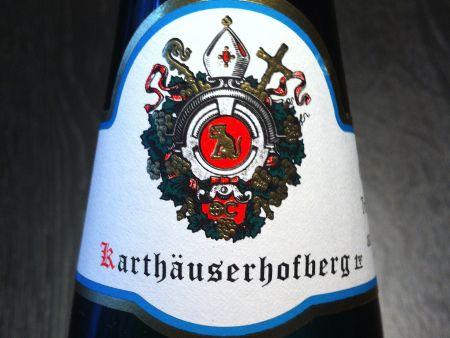 Among the wines at Martin's recent event, I did re-taste the 2013 Dhroner Hofberg Kabinett from A.J. Adam last month. It's a very good wine. I also like the 2013 Maximin Grünhäuser Abtsberg Kabinett from von Schubert. Many of the others, I've yet to taste. Photograph stolen and edited, but still credited to Martin Zwick. I’d also like to clarify my first footnote above, especially since I met up with Jean and David of Mosel Fine Wines on the Saar yesterday. We were tasting wines at an estate, and I didn’t feel like it would be appropriate to broach the subject. The German wine guides Gault Millau and Eichelmann aren’t cheap, and the producers are requested to send free samples (which is no small sum). Gault Millau asks for 200 euros. In return, the producer receives a couple new wine guides and other perks. In 20009, Gault Millau had controversy over its approach. Several prominent producers signed an open letter complaining about the fee and how certain producers tasted in the jury. Eichelmann, on the other hand, has recently upset a number of growers who are now required to pay several hundred euros in order to have their wines reviewed now. It’s understandable that many have boycotted sending samples to Eichelmann. Anyway, most of the copies from these guides are purchased by the growers and the wine trade. I think, however, that it is smart to charge some money for writing thorough reports on a wine region, even if it’s online and just a hobby. The other day, I read an article about the wine critic John Gilman, who makes a pretty penny writing tasting notes. Like Mosel Fine Wines or Burghound.com, he publishes PDFs. I feel that if we value our work, we should be paid for it. I personally don’t score wines or have a wine buyer’s guide per se, and thus I don’t see myself in direct competition with Mosel Fine Wines, Stephan Reinhardt of The Wine Advocate, or David Schildknecht in reporting about Mosel Riesling. I decided early on to focus on other topics beyond tasting notes. That might explain why I’m scraping by on my earnings as a wine broker and translator, among other freelance work. Few of us can make a living writing about wine, much less on one wine region. Moreover, I’m glad to see that Bill Nanson has decided to charge a fee for his Burgundy-Report, much like John Livingstone-Learmonth’s Drink Rhône and Peter Liem’s ChampagneGuide.net. I even told Bill that he should do this. Why undercut fellow wine writers, even if it’s not intentional? Allen Meadows’s Burghound.com costs a fee, too. Meadows already made plenty of money in the financial sector, before he became a full-time wine critic in Burgundy. Unfortunately, more and more wine writers will be those who can afford it, because they don’t have to worry about making ends meet. In March 2013, a blogger became upset when I published an article behind the paywall. I had posted a link on my seldom-used Facebook page, and he complained on my timeline, instead of writing me an email. Another Facebook “friend” ridiculed me. This occurred within minutes of my posting the link on social media. I couldn’t believe it, so I emailed the well-to-do retiree/blogger asking him for an explanation. “Because I was shocked and appalled when I hit the pay wall. I enjoy reading your stuff, but not for Euro 27 per year,” he says. As a free member, he was “shocked and appalled”? (My site actually costs 29 euros per year, or about 2.42 euros a month.) His was a backhanded compliment for sure. It’s like going up to a winegrower and enjoying his or her wines, but then saying that you wouldn’t pay for an inexpensive bottle. The product of our work, whether as a grower or writer, can’t always be for free.